For almost half a century stretching from the 1920s to the 1960s, the most popular casual footwear brand in Asia was Fung Keong (馮強). First manufactured in Canton in 1920, and later in Hong Kong and Malaysia, Fung Keong rubber sole canvas shoes had massive appeal during those years of economic hardship due to its affordability and are permanently etched in the collective memory of those who grew up in Hong Kong and Southeast Asia during that era. However, little has been written about the man behind the shoes – Mr. Fung Keong, who first made his fortune in Malaysia, built a multinational business empire and died in Hong Kong which is also his final resting place. The only written bio of Fung Keong the author has located is a 4 page excerpt from the privately circulated Wan Fou County Records(雲浮縣志), a publication about Wan Fou (雲浮, Cantonese prounciaton, Yunfu in Mandarin), the relative obscure prefecture in western Guangdong province which Fung hailed from and published by Kiu Kong Wan Fou Club (僑港雲浮會所有限公司), the hometown association in Hong Kong which he also served as permanent chairman for decades. His alias were Fung Poi-fong and Fung Kwok Kee (馮國基). According to the short bio, he migrated from Wan Fou to Seremban in West Malaya (now Malaysia) at the age of 11 in 1902 where he studied machinery and within a decade he made a fortune in rubber. Despite having left his homeland in a relatively young age, Fung maintained a keen interest in China and its politics and was appointed by Sun Yat-sen as the general secretary of the Seremban branch of the KMT in 1920 and vice chairman the next year. In 1920, he returned to Canton and established a rubber factory under the name of Fung Keong Rubber Manufactory (馮強樹膠製造廠) to manufacture rubber shoes near the Hoi Chu bridge in the south side of the Pearl River. Fung Keong was not the first person to start a rubber shoe factory in Canton or China, that honor goes to Tang Fung Chi (鄧鳳墀), a lumber merchant who founded Kwangtung Brothers Rubber (廣東兄弟) in Canton in 1919 with his ninth son Tang Siu-pang (鄧兆鵬) who returned to China from Singapore. (1) This was only few years after U.S. Rubber launched Keds, the first mass marketed canvas rubber sole shoes in the world in 1916. According to an article about the rubber industry in Canton, the period between 1920 and 1936 was the golden age for the rubber industry in Canton with over 100 factories and total output over 10 million shoes per year. Starting with only 100 workers, Fung Keong through quality products, successful marketing and innovation (such as introducing aluminium shoe lasts) has emerged as the leader of the pack with over 400 workers, daily output of 4000 pairs and as much as 9000 pairs in peak season. (2) According to the bio in Wan Fou County Records, at its peak the Canton factory employed 1500 staff. We are indebted to a correspondent for the following notes on one of the largest of Hong Kong’s manufacturing industries,the making of canvas, rubber-soled boots and shoes. This account is based on a visit to the Fung Keong Rubber Manufactory at Shaukiwan. The Fung Keong Rubber Manufactory which was established about ten years ago, has an extensive range of premises near the tram terminus at Shaukiwan. The Firm are large importers of British Empire products and employ from 1000 to 1800 prople according to the season. The rush time in the manufacture of rubber shoes is in the winter because the Chinese trade then increases considerably whereas many Chinese who wear shoes in winter go about barefoot in summer. The daily output of the factory in the busy season is 10,000 pairs, and at present 6,000 pairs. The firm has a Canton branch factory with an output of 7,000 pairs a day, but this is closed at present on account of labour problems. It will be re-opened in the near future. With the adoption of Imperial Preference, and increased tariffs in many parts of the British Empire against non-British goods, there has been a considerably increase demand in the last nine months or so from various parts of the Empire for rubber shoes produced in Hong Kong. The Straits Settlements and Federated Malay States form an important market. Hong Kong can compete with local production there because Chinese workers in the South being “strangers in a strange land” draw higher wages, just as Europeans do in the Far East. Raw Materials The rubber for the soles comes from the Federated Malay States, canvas for the uppers from Lancashire, Shanghai or the United States of America. It has been stated in Hong Kong that Lancashire makes no equal at the price (if at all) of the Woodberry canvas manufactured in the United States of America. If Lancashire manufacturers dispute this, Hong Kong British importers will be glad to hear from them as they welcome the opportunity of giving a preference to British goods where possible. The shoe laces are made in Hong Kong and provide a large standing order for another local factory; the cyclets and binding tapes are imported from England. The cartons in which each pair of shoes is packed keep a local cardboard factory fully occupied. A visit to the shoe factory will be found of considerable interest. The place is veritable hive of industry and mass production methods are resorted to various groups of workers performing one process only and thereby developing remarkable skill. Each worker applies an identification mark to his or her output, so that if the finished product develops a particular defect the worker responsible can be identified. The workers are employed for the most part on piece work term. The hours the factory is open are from 7am to mid-day and from 1pm to 6 pm. Crepe rubber Crepe rubber is imported from the Federated Malay States in thin sheets: it is worked up with various chemicals between hot rollers until it becomes of a texture suitable for the soles of shoes. The crepe effect on the underside of the sole is quite simply produced by having one roller with a roughened surface and the other smooth. The soles are cut out from the sheers of rubber in a manner very similar to the way a pastry cook cuts tarts from piecrust. The rubber is of such an enduring nature that the soles always outlast the shoes. In other parts of the factory rolls of canvas are fed between rollers and glued together with paste made of flour and water treated with formaling as an additional precaution against “Hong Kong foot”. When two rolls of canvas have thus been glued into one, the pieces are stretched out on tables and women supplied with pencils and stencils sketch like lightning the various parts of the uppers of shoes. The rolls are then passed on to other women workers who cut out the material along the stenciled lines. Elsewhere, binding tapes are prepared. The process of binding theupper and inner soles together by a band of tape is known as “foxing”. Vulcanizing The factory requires a large number of aluminium shoe lasts because the sole lining, toe-cap and upper of each shoe is assembled on a model last and is finally welded into a satisfactory whole by being placed still on its last, in a vulcanising chamber. Hundreds of shoes go into a single chamber at one time, each hanging separately from rods. They remain at a temperature of 120 degrees Fahrenheit for 45 minutes. The apparatus is fitted with an automatic safety valve and a gauge to prevent the brai from rising too high or falling too low. The heat does not affect the canvas, and the result of the vulcanising is that the shoes stand up against wear is a way which they would not do if merely stuck together with rubber solution. Motorists and cyclists will appreciate the difference between hand repair of a rubber tube and the vulcanizing of the patch. The Factory Plant The factory plant includes a 130 horse power electric motor, five additional smaller motors and two crude oil engines. Steam passes through all rollers dealing with crude rubber. Dozens of specially built Singer Sewing machines, electrically drives, perform the sewing operations at lightning speed. The factory has its own repair plant. The cases in which the crude rubber arrives from the Federated Malay States are converted on the premise into export cases by the factory’s carpentry department. All day long, men specially engaged from Shanghai make the lasts. The aluminium similar to the metal used in the linotype machine, cools rapidly and the lasts are completed at great speed. In order to meet the demands of the plant one hundred lasts have to be made of each of the 24 sizes of each pattern of shoes, and the result is that there are at the moment on the premise approximately 225,000 pairs of lasts. In the factory office are hundreds of pairs of “reference samples” representing orders which have been filled in times past which can be repeated if necessary.One of the trials of the business one gathered, is that customers frequently ask for “something different” from stock pattern for instance, the toe decoration of the model and the strap fastening of another. Or they want six eyelet holes or four eyelet holes, instead of two. Sometimes what seems like a trifling request from the customers involve expensive adaptation of machineries. Large stock of up to 250,000 pairs The total output of the factory is booked up for many months to come. On December 21 st , 1934, Hong Kong Governor Sir William Peel accompanied by Secretary of Chinese Affairs N.L. Smith and Inspector of Factories F. Meade visited the Fung Keong factory in Shaukiwan. (4) According to the Hong Kong Daily Press, the Governor visited twenty odds departments of the factory from raw materials to finished shoes and was “delighted”. The visit must have been one of the proudest moments in Fung Keong’s life as the event was specifically highlighted and the picture was reprinted in his bio in the Wan Fou County Records. The HK Daily Press article mentioned that “its products, which consist of a few hundred styles of shoes are exported in large quantities both to China and to foreign countries, and the business has since been very flourishing and prosperous”. It further adds that “this is the result of Mr Fung Keong’s many years experience and study acquired from abroad. It is not very much affected by the present depression on account of the recognised superior quality of its products and the various markets acquired, and also backed by a sound financial standing”. At that point Fung Keong Rubber was an unlimited company with Fung Keong as its sole owner. 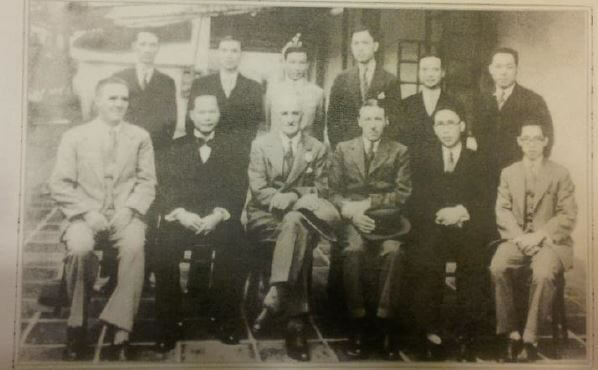 First row left to right: F. Meade (inspector of Factories), Fung Keong, Governor Peel, N. L. Smith (Secretary for Chinese Affairs), Ngan Shing Kwan (顏成坤 Chairman, China Motor Bus), Ignatius Tang (manager of Fung Keong Canton factory); Second row left to right: Mr Au Kai-ming (歐啟明), Mr. Fok Kam-shek (霍金石), Mr. Fung Che-yee, Mr. Pang Kam-wing(彭錦榮), Mr. Fung Yat-hing (馮日興)and Mr. Tang Chi-nam (鄧子楠). While Fung Keong Rubber’s number one product was its Pagoda brand (寶塔) canvas rubber sole shoes (although most people refer to them as “Fung Keong shoes”), it also manufactured tires for bicycles and automobiles and other rubber goods such as gas masks. 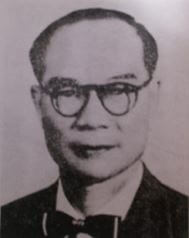 With his rubber profits, Fung diversified into other businesses in the 1930s by investing in the New Asia Hotel and Ka Wah Savings Bank in Canton and Hong Kong (these two enterprises were founded by Chinese Baptists affiliated with the Pui Ching Middle School) and China Motor Bus in Hong Kong (whose founder Ngan Shing-kwang was present in the 1934 Governor’s visit to the Fung Keong plant). Fung was also active in philanthropy, particularly in his hometown of Wan Fou where he donated hospitals and roads and founded the Fung Keong School in 1932 (with his younger brother Fung Kwok-sau as principal) which exist to the present day. 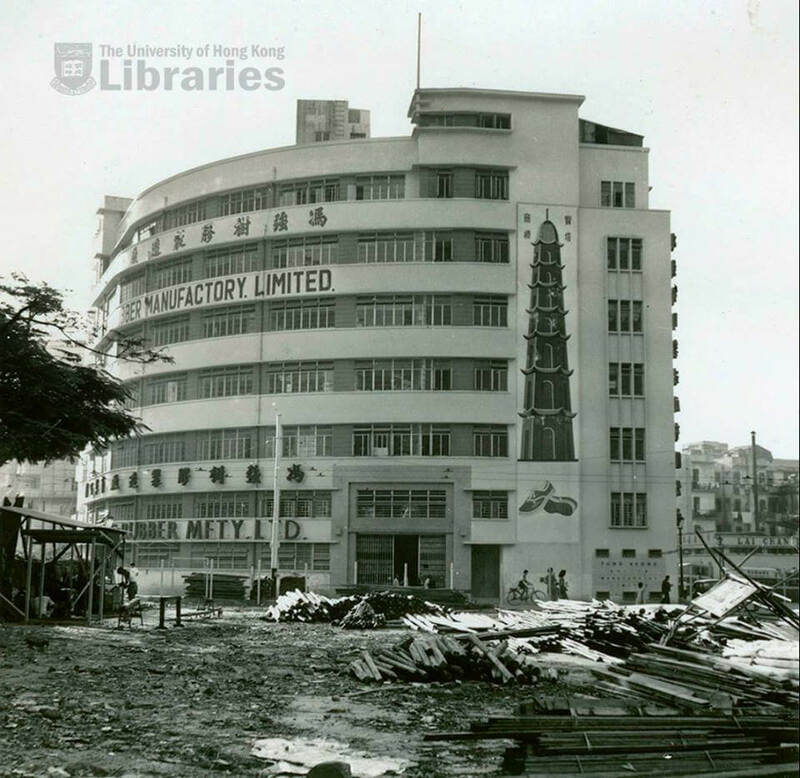 By mid 1960s however labor unrest plagued the factory and in August 1967, the Hong Kong factory shut down on court orders due to non-payment of debt. Although Fung Keong continued his Malaysian operation and winded down his Hong Kong operation, he chose to maintain Hong Kong as his primary residence and on February 7 th 1973, he passed away in Hong Kong Sanatorium. His funeral was held at the Hong Kong Funeral Home and he was buried in the Catholic Cemetery in Happy Valley. This article was first posted on 13th October 2015. In the 1920s, Kwangtung Brothers was a top brand in China having established its base in Shanghai and promoted its products through celebrity endorsements. However, the firm ran into financial difficulties in 1935 and its position was overtaken by Fung Keong. “Fung Keong Rubber Manufactory: H.E. The Governor’s Visit” HK Daily Press, December 22, 1934.